The novel tyrosine kinase inhibitor AKN028 has demonstrated promising results in preclinical trials. An expedient protocol for the synthesis of the compound at kilogram scale is described, including an SNAr reaction with high regioselectivity and a Suzuki coupling. Furthermore, an efficient method for purification and removal of residual palladium is described. 13C NMR (DMSO-d6) δ 149.9, 145.2, 145.0, 139.6, 132.8, 132.4, 132.2, 128.4, 127.6, 125.6, 118.7, 116.1, 111.2, 111.0, 101.0. Protein kinases are involved in the regulation of cellular metabolism, proliferation, differentiation and survival. The FLT-3 (fms-like tyrosine kinase) receptor is a member of the class III subfamily of receptor tyrosine kinases and has been shown to be involved in various disorders such as haematological disorders, proliferative disorders, autoimmune disorders and skin disorders. In order to function effectively as an inhibitor, a kinase inhibitor needs to have a certain profile regarding its target specificity and mode of action. Depending on factors such as the disorder to be treated, mode of administration etc. the kinase inhibitor will have to be designed to exhibit suitable properties. For instance, compounds exhibiting a good plasma stability are desirable since this will provide a pharmacological effect of the compounds extending over time. 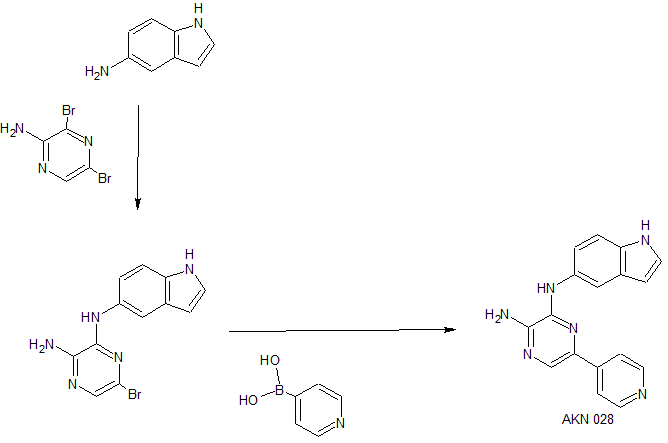 Another example is oral administration of the inhibitor which may require that the inhibitor is transformed into a prodrug in order to improve the bioavailability. WO 2009/095399 discloses pyrazine compounds acting as inhibitors of protein kinases, especially FTL3, useful in the treatment of haematological disorders, proliferative disorders, autoimmune disorders and skin disorders. This document discloses methods for manufacturing such compounds. However these methods are not suitable for large scale processes and the chemical yields are moderate. Furthermore, the compounds obtained by these methods are in amorphous form. c) removing the palladium from the crude product in step b). The compound of formula (I) may be obtained in amorphous or crystalline form using the processes outlined below. nucleophilic substitution reaction in the presence of a C1-6alkylamine and an inert polar solvent yields 3-bromo-N-3-(1H-indol-5-yl)-pyrazine-2,3-diamine (3). Examples of inert polar solvents are DMSO, water and NEP. Examples of (C1-6alkyl)3amine are triethylamine, trimethylamine and tributylamine. The reaction may be performed at reflux temperature or at about 100-130°C. K2CO3 The reaction may be performed under inert and oxygen-free atmosphere such as nitrogen or argon. Heating may take place during step 1 and/or step 2. Steps 1 and 2 may be performed at reflux or in a temperature range of from 100 to 140°C, such as from 105 to 135°C, such as from 110 to 130°C, such as from 130-135°C, such as from 110-115ºC. A compound of formula (I), also denominated N-3-(1H-indol-5-yl)-5-pyridin-4-yl-pyrazine-2,3-diamine, in amorphous form may be dissolved in acetic acid (HOAc) after which potassium hydroxide (KOH) is added. The compound of formula (I) in amorphous form may be obtained from the process outlined in steps 1 and 2. Alternatively, the compound of formula (I) may be obtained according to the process described in WO 2009/095399. The obtained crystalline form is removed from the slurry by, for instance, filtration. Step 3 may be repeated. Step 3 may be performed at a temperature of about 40°C followed by cooling to room temperature. The process for preparing a compound according to formula (I) may comprise an additional step (step i) between step 2 and step 3 in order to remove palladium from the crude product of the compound of formula (I). The step comprises; forming a slurry comprising an acid and the compound according to formula (I) in a solvent, adding a siloxane compound to said slurry, removing the solvent from the slurry and adding an organic solvent, such as DMF and/or toluene, to the solid formed whereby a mixture is formed and then potassium hydroxide is added to the formed mixture, Alternatively, palladium may be removed from the crude product comprising (I) using a palladium scavenger such as TMT and/or 3-mercaptopropyl ethyl sulfide silica. dichloromethane/methanol followed by evaporation of the solvent in a rotary evaporator. The amorphous form of the compound of formula (I) may obtained using the process disclosed in WO 2009/095399. agitated for an additional 2.5 hours. There was no improvement in conversion. The reaction mixture was agitated at ambient temperature overnight. Triethylamine (3.5 kg) was removed under vacuum and the remaining reaction mixture was transferred to a stainless steel container from which it was charged into another reactor. Subsequently, 18.4 kg of 50% acetic acid (aq.) was introduced over a period of 20 minutes under agitation, followed by purified water (61 L) charged over a period time of 60 minutes. The slurry was then filtered and the isolated material was washed with 2 x 20 L of 1% acetic acid (aq.). The isolated 3-bromo-N-3-(1H-indol-5-yl)-pyrazine-2,3-diamine) (3) was transferred to a drying cabinet and dried to invariable weight at 40 ±3°C, (19 hours), to afford 4.36 kg, 14.34 mol, 81 % yield, with a purity of 96% by HPLC. The reaction temperature in the batch record was set to be 130-135°C. However, at 95°C the reaction mixture was at reflux. To a reactor was charged N,N-dimethylformamide (46.7 L, 45 kg), 4-pyridylboronic acid (4) (2.64 kg, 21.5 mol, 1.5 eq.) and 5-bromo-N-3-(1H-indol-5-yl)-pyrazine-2,3- diamine (3) (4.36 kg, 14.3 mol). The reactor was then flushed with nitrogen prior to the charging of Pd(dppf)Cl2-catalyst (0.47 kg, 0.55 mol, 0.04 eq.). To reactor was then charged, over a period of 20 minutes, 24.9 kg of a 2 M solution of potassium carbonate (aq.). The reactor was flushed with nitrogen and heated under agitation to 110-115°C for 1.5 hours, after which 98.3% conversion of (3) was showed. The reaction mixture was quenched by addition of purified water (180 L) under vigorous agitation. The precipitated material was isolated on a hastalloy filter and washed with purified water (50 L), The isolated material was transferred to a drying cabinet and dried to invariable weight at 40 ±3°C (18 hours), to afford a compound of formula (5), i.e. a compound of formula (!) also denominated N-3-(1H-lndol-5-yl)-5-pyhdin-4-yl-pyrazine-2,3-diamine, (3.64 kg, 12.1 mol, 85 % yield). During the process precipitated material was observed in the solutions, after the reactions, in both steps not previously seen in lab-scale. These impurities were not removed. In order to remove residual solvents from the material, two consecutive re-precipitations of the material from acetic acid were performed. This also gave crystallinity of the isolated substance. The purification is performed in order to remove palladium. (aq) and 2×35 mL purified water. The obtained filtrate was transferred to a 2 L round bottomed flask containing 950 mL of Me-THF. The mixture was then stirred and heated to 40°C for 30 minutes. To the solution was then added 290 mL 8 M KOH (aq.) at 40°C and pH in the solution was 14. The aqueous phase was removed and the organic phase washed with 2×100 mL of purified water. The remaining organic phase was then transferred to a 2 L round bottomed flask, followed by 95 mL of DMF, 20 g scavenger 3-Mercaptopropyl ethyl sulphide silica, Phosphonics LTD and 20 g scavenger 2-Mercaptoethyl ethyl sulfide silica purchased from Phosphonics LTD. The solution was vigorously stirred and heated at 60°C. A sample was withdrawn from the slurry after 12 hours, and showed 6 ppm of palladium remaining in the solution. The mixture was allowed to cool and was then filtered to remove the scavenger. The round bottomed flask and filter were rinsed with a mixture of 90 mL Me-THF and 10 mL DMF. Me-THF was then removed on a rotary evaporator and the remaining slurry was azeotropically dried with two portions of 100 mL toluene. To the remaining slurry was then added 85 mL of DMF to a total of 185 mL DMF (5ml DMF/g substance). To the clear solution was then added, slowly, while agitated, 1500 mL of toluene which produced a heavy precipitate. The slurry was filtered off and washed with 2×50 mL of toluene where after the material was dried overnight at 35°C under vacuum to afford 30.9 g of a compound according to formula (I) in a yield of 82%. The N-3-(1H-indol-5-yl)-5-pyridin-4-yl-pyrazine-2,3-diamine material (30.9 g) was added to a 1 L round bottomed flask and 450 mL 2 M HOAc (aq.) was added. The slurry was agitated and heated to 40°C for 1 hour, until the material had dissolved. To the solution was then added 158 mL 8 M KOH (aq.) at 40°C. The pH in the solution was 11.4. The slurry was then allowed to cool to 25°C and filtered. The filter cake was washed with 3x 80 mL of purified water and the material was dried overnight at 95°C under vacuum to afford 28.7g N-3-(1H-indol-5-yl)-5-pyridin-4-yl- pyrazine-2,3-diamine in a yield of 93%. N-3-(1H-indol-5-yl)-5-pyridin-4-yl-pyrazine-2,3-diamine material (28.7 g) was added to a 1L round bottomed flask and 430 mL 2 M HOAc (aq) was added. The slurry was agitated and heated to 40°C for 1 hour, until the material had dissolved. To the solution was then added 15 mL 8M KOH (aq) at 40°C. The pH in the solution was 12.3. The slurry was then allowed to cool to 25°C and filtered. The filter cake was washed with 5×50 mL of purified water, and the solid was then dried overnight at 95°C under vacuum to afford 28.3 g N-3-(1H-indol-5-yl)-5-pyridin-4-yl-pyrazine-2,3- diamine in a yield of 99%. The N-3-(1H-indol-5-yl)-5-pyridin-4-yl-pyrazine-2,3-diamine material (2.1 kg, 7 mol) was added to a reactor, followed by 2M HOAc (aq.) (59.6 L, 60.2 kg) . The solution in the reactor was then heated to 40°C and stirred for 20 minutes. To the clear solution was then charged, slowly, 30% KOH (aq.) (25 kg) under vigorous agitation. The slurry was agitated for 15 minutes. pH in the solution was 6.2, and a total of 1.5 kg 30% KOH (aq.) was then added to the solution to give pH 12.1. The precipitated material was isolated on a Hastelloy filter and washed with purified water (5×30 L). The solid was then transferred to a drying cabinet and dried to invariable weight at 85 ±3°C under vacuum (16 hours; a sample was withdrawn after 16 hours, showing 1400 ppm HOAc and 75 ppm DMF), to afford N-3-(1H-indol-5-yl)-5-pyridin-4-yl-pyrazine-2,3-diamine (2.0 kg, 7 mol, 95 % yield). Hence, N-3-(1H-indol-5-yl)-5-pyridin-4-yl-pyrazine-2,3-diamine is obtained in an uniform crystalline form, which was achieved by precipitating the product from aqueous acetic acid by introduction of aqueous potassium hydroxide. 2-Amino-3,5-dibromopyrazine (45 g, 1.0 eq. ), 5-aminoindole (30,6 g, 1.3 eq. ), 67.5 mL NEP, i.e. 1-ethyl-2-pyrrolidone, and 74.5 mL triethylamine were added to a 250 mL reactor. The jacket temperature was set to 130°C and the reaction mixture was stirred for 22 h. HPLC after 22 h showed 87% conversion of the 2-amino-3,5-dibromopyrazine. After 24 h HPLC showed 92% conversion and the reaction slurry was cooled to 80°C and quenched by addition of addition of 50% HOAc(aq) and water. The obtained slurry was then allowed to cool to room temperature over night while agitated. The material was isolated on a glass filter funnel and was washed with water. The material was dried at 80 °C under vacuum until dry to afford 71% of the compound 5-bromo-N-3-(1H-indol-5-yl)-pyrazine-2,3-diamine as a dark brown powder. The purity was 99.8% as measured by HPLC. thermometer, and a nitrogen atmosphere. Through a septa was added 2M K2CO3 (aq) (27 ml, 54 mmol, 1.1 eq.) with a syringe. The temperature was increased to 100 °C. Samples for HPLC-analysis of the conversion were drawn and when the conversion had reached 100% the temperature was cooled to 25 °C. At that temperature a water solution of 0.5 M L-cysteine (150 ml) was added by a syringe pump over 1 hour with a rate of 2.5 mL/minute. After 3 hours maturing time at room temperature the material was isolated on a glass filter funnel and was washed with water. The material was dried at 40 °C under vacuum over the weekend, and 15 grams of N-3-(1H-indol-5-yl)-5-pyridin-4-yl-pyrazine-2,3-diamine (101%) were obtained as a brown powder. The crude (7.0 g, 23 mmol) and 2M HOAc (98 mL) was added to a 250 mL round-bottomed flask. To this was added TMT, i.e. trithiocyanuric acid, (1.4 g) and SPM32, i.e. 3-mercaptopropyl ethyl sulfide silica, (1.4 g). The mixture was stirred in room temperature for 24 hours. After 24 hour a polish filtration through hyflo super cel was performed. To the clear filtrate was added 50 mL 5 M KOH(aq) under 15 minutes to precipitate the product. After 18 hours maturing time at room temperature the material was isolated on a glass filter funnel and was washed with 2×20 mL water. The first was being a slurry wash and the second a displacement wash. The material was dried at 40 °C under vacuum over the weekend, and 3.9 grams (56%) was obtained as a light yellow powder. The Pd content was 3.7 ppm. 1: Eriksson A, Hermanson M, WickstrÃ¶m M, Lindhagen E, Ekholm C, Jenmalm Jensen A, LÃ¶thgren A, Lehmann F, Larsson R, Parrow V, HÃ¶glund M. The novel tyrosine kinase inhibitor AKN-028 has significant antileukemic activity in cell lines and primary cultures of acute myeloid leukemia. Blood Cancer J. 2012 Aug 3;2:e81. doi: 10.1038/bcj.2012.28. PubMed PMID: 22864397; PubMed Central PMCID: PMC3432483.